Reflecting on my experiences as a graduate student, I argue that the terminology of public sociology should be dropped. The public sociology rhetoric is at odds with the fundamental professional reality in the discipline. Sociology, as a “hyper-professionalized” endeavor, primarily values abstract, explanatory theories, even if those theories make the world less descriptively comprehensible to people seeking to act in the world. Moreover, I question whether sociologists, as a professional class, should or can take on the public position as the partisan representatives of civil society and marginalized peoples. 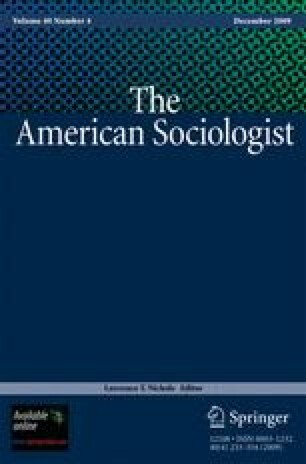 Instead, I argue for a greater openness within professional sociology to descriptive work, as well as more departmental supports for graduate students to pursue careers outside of sociology. Sociologists interested in public engagement should focus primarily on cataloguing and practical evaluation of engaged research tactics and community oriented teaching strategies, rather than theoretical discussions of what sociology can or should be. I would like to express my special appreciation to Laura Enriquez and Neil Fligstein who supported and encouraged me so selflessly and professionally throughout my graduate studies. Numerous colleagues have commented on this piece including Siri Colom, Shannon Gleeson, Basak Kus, Ruha Benjamin, reviewers and the editor. Their input has added immensely to this article, while the faults and errors are my own. ASA_Task_Force. (2007). Standards of public sociology: guidelines for use by academic departments in personnel reviews, Retrieved 2007 (http://pubsoc.wisc.edu/e107_files/public/pandt.html). Deflem, M. (2007). Public sociology, hot dogs, apple pie, and Chevrolet. The Journal of Public and Professional Sociology, Retrieved 2007 (http://www.gsajournal.com/Deflem.pdf). DOL. (2006). Occupational Outlook Handbook (OOH), 2006–07 Edition, Retrieved 2007. US Department of Labor, Bureau of Labor Statistics. (http://www.bls.gov/oco/). Rinalducci, N. (2007) Sociological accessibility: the importance of public in professional sociology. The Journal of Public and Professional Sociology, Retrieved 2007 (http://www.gsajournal.com/RinalducciArticle.pdf).